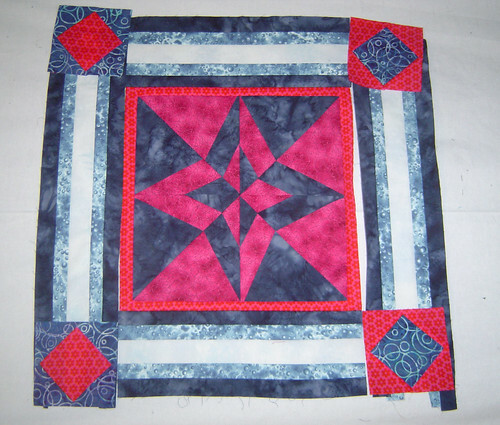 I am so glad we have our 2 month deadline for our round robin quilts now, instead of 1 month like before. 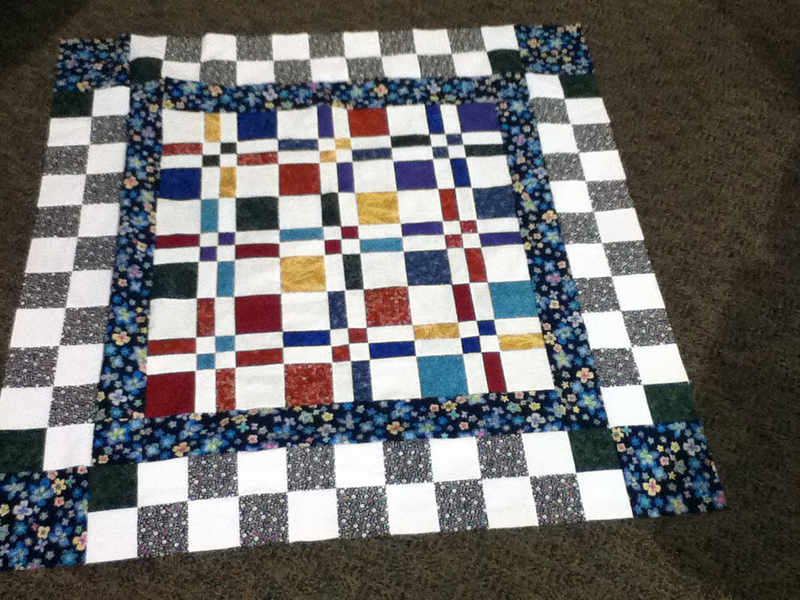 For Laura’s round robin center, I have been working on a neutral quilt that has been challenging & stretching me. 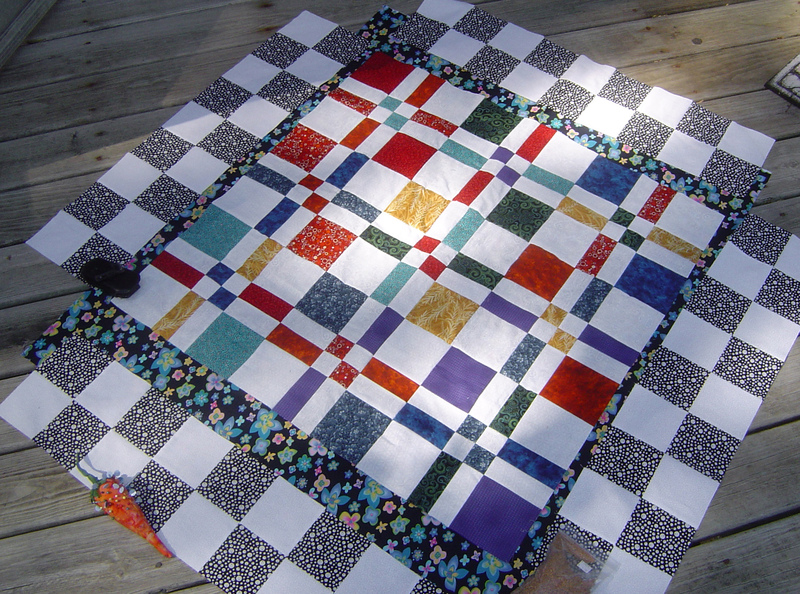 I can’t say I have done too many neutral quilts before – maybe just the card trick quilt. And that quilt is more fall colors, without sticking strictly with neutrals. I have been happy to think about this quilt, but so far, this quilt has generated more EQ7 designs and colorations than ANY other quilt I have done, round robin or not. I have many different directions to go with this quilt. 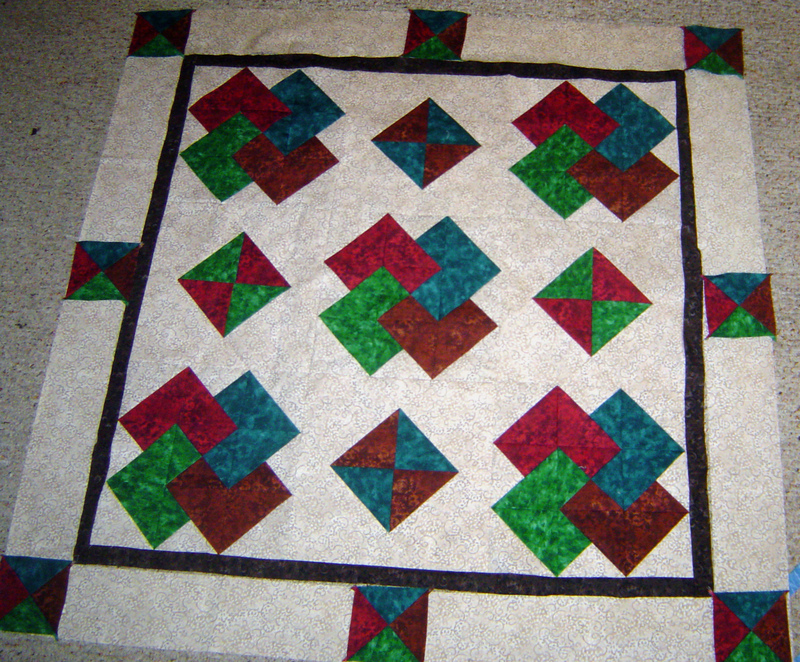 Here is the center of the quilt, the original block. Look at the browns, the golds, but also the greys, and hint of blue/bluegrey. Someone in the journal said there is a theme of pebbles, someone later said a theme of geese. It immediately made me think of cranes, and the unique opportunity of my hometown. I used to live in a section of Nebraska, where in March, scores of Sandhill Cranes would roost on their trip back to Canada. Like they ALL decided to fly up through this 60 mile section of land and so it was / is a really big deal there! Being late March, usually seeing the cranes happened on cool grey days, fields of plowed corn, you could see hundreds or thousands of cranes taking a breather. Nearing the Platte River. Anyway, cranes & pebbles & geese & grey March skies was my inspiration for this round of the quilt. 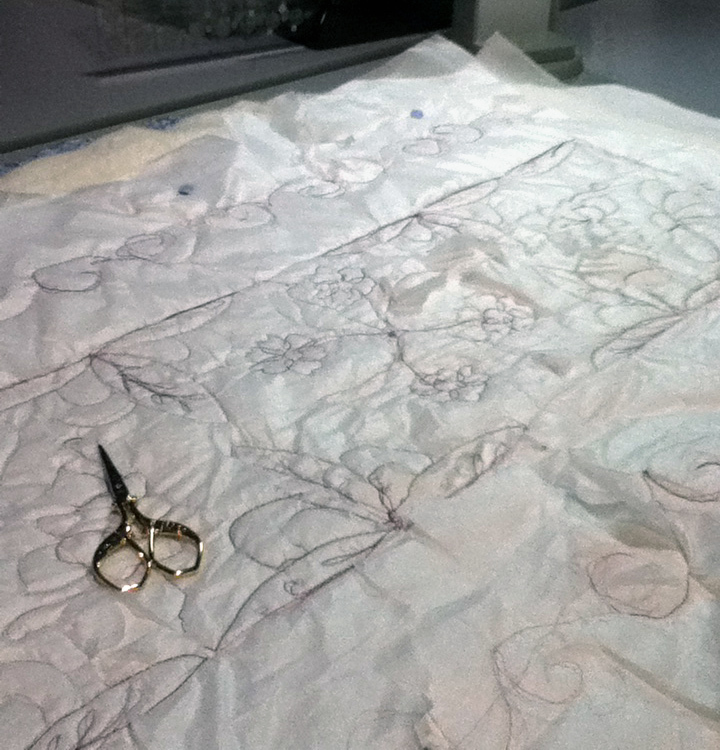 I had my heart set on an eyelash design, which would have been doable, but curves and paper piecing for that quilt, at the size I wanted to do, would have been too much work & struggle. The first idea is what I bought fabric for. I was trying a couple of the original fabrics, inserting a couple of my own. I went out on a couple of days trying to purchase good fabrics and I fell in love with the dark/medium-dark grey blue pictured above and below, which sorta guided the rest of my color choices. 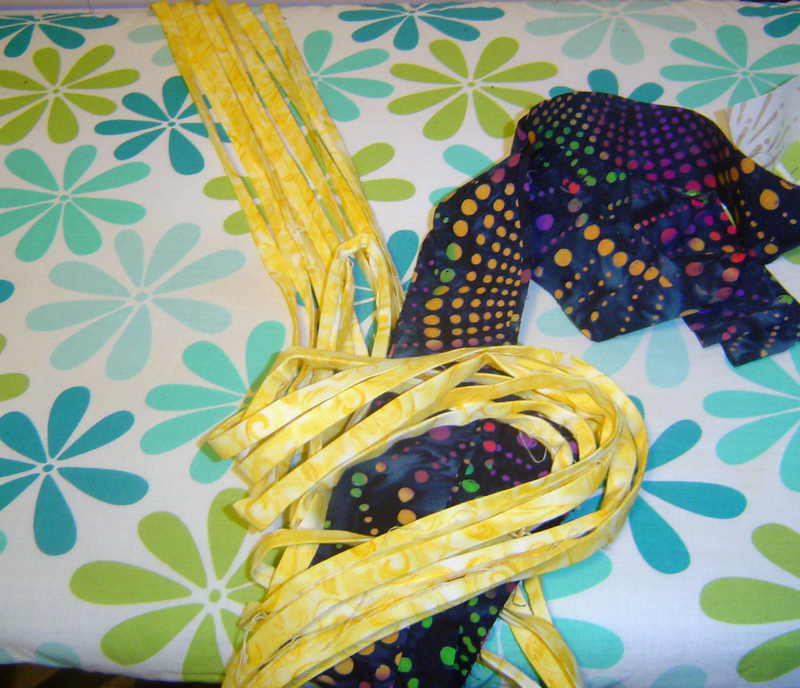 And this being smack dab in the medium color scheme, sorta blended in with my second most favorite fabric choice idea. So again, going out for fabric purchases, and a second round of online purchases directed me to THIS fabric aquisition for my stash. To build up my neutral quilt colors, yeah. I finally kept coming back to a light and dark version of taupe to compliment the blue/grey fabric pictured above. This is what I had in EQ7 that pleased me so well. 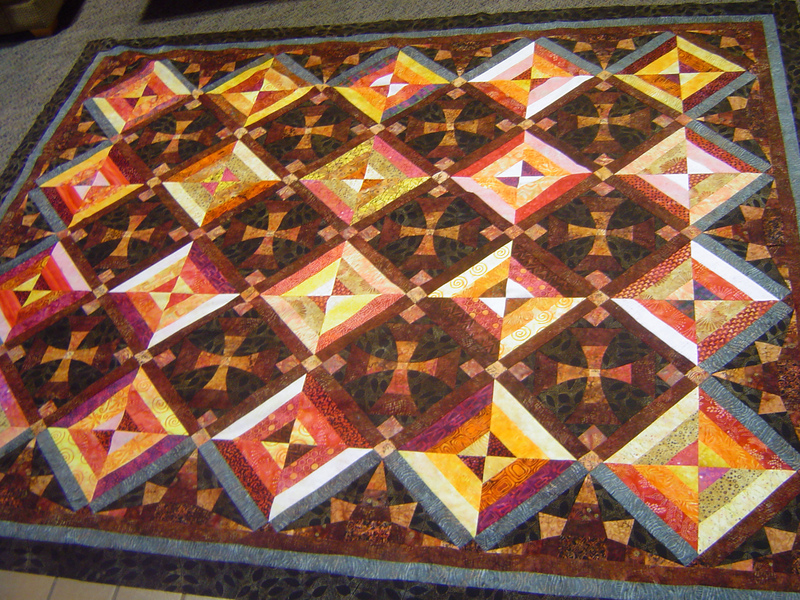 Just enough of a color shift to be interesting, but not enough of a derivation of the original quilt. I actually saw a glimpse of what I would consider to be ‘the perfect’ fabric compliment to the rest of the design. A japanese fabric line Serenity, Diawabo fabric. Searching online did not provide me with the exact shade of serenity that I glimsped a small piece of (in a fabric kit) at the quilt shop. So I am making due with the main part of the borders using blue grey, and finally, one of the fabrics above has the perfect taupe color that will hopefully not detract too far from the colors of the rest of the quilt, but also frame it in the fun “darker” border I want to go with for this round. Unfortunately the fabric with the taupe isn’t quite as “natural” of a setting as I would hope, but the colors match well enough. I only wish I could have found the right color of taupe in the serenity line. The one that looked the closest online, in real life turned into much more of a brown shade instead of a taupe shade. 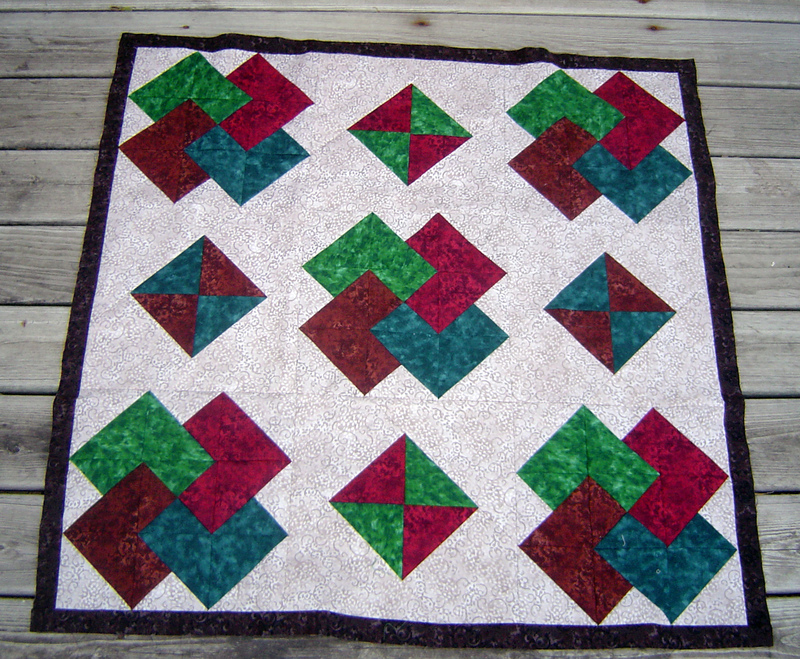 So we are heading toward the green a little bit with this quilt, but only a very very small amount of green. There is a small small smidge of green tint in the focus fabric – which the store clerk at one of the stores said was also from the same serenity fabric line – what a coincidence. So it should match up ok. I am finally almost halfway done with the middle section of the blocks I finally decided to use. The blocks are many, but they are fairly simple. And dramatic! Still a lot of work here. 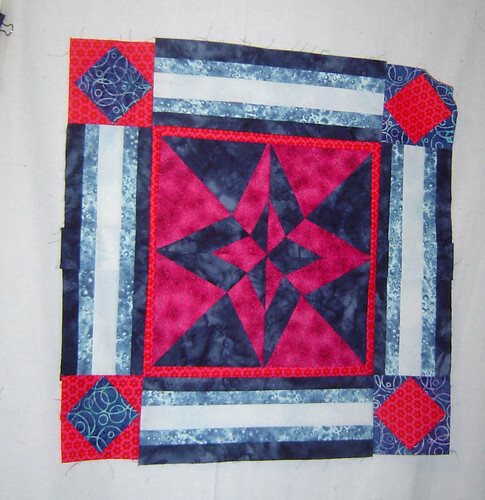 I have put undo pressure on myself to “outdo” myself on this round robin quilt, as I have on the ones past. Here’s a very very narrow, small snippet of what I am working on. None of the finally found taupe in the picture below, but the two shades of grey that I couldn’t ‘unleach’ myself from once I saw them together next to the quilt. Man, I hope all of you are realizing what little time we have left. 1 week until the big holiday. Still have 2 presents to buy, but I have most of the rest done, except for wrapping. And I have not promised anything (*edited* crafty) for christmas to anyone in my family. Granted I have a giveaway quilt that I started 2 months ago that eventually will go out, but that’s not christmas related. I don’t like the pieced back I made at all right now anyway. And now there’s little time before a family party this afternoon an hour away. And since I’m so sick of orange & orange fabric, I thought I’d share & harken back to a UFO I started in February. 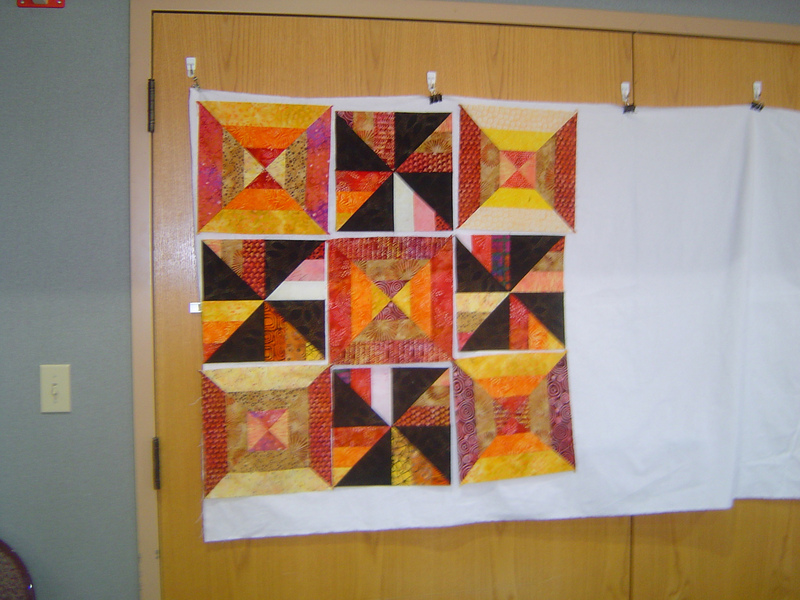 I made a weave quilt top center (okay not pieced together, but I have it all laid out ready to piece – blocks are done). And for a while I put it aside to think about the borders. And in October I came up with the borders for this quilt. And here is a graphical picture of the block I created. And I was wondering exactly how to do this. 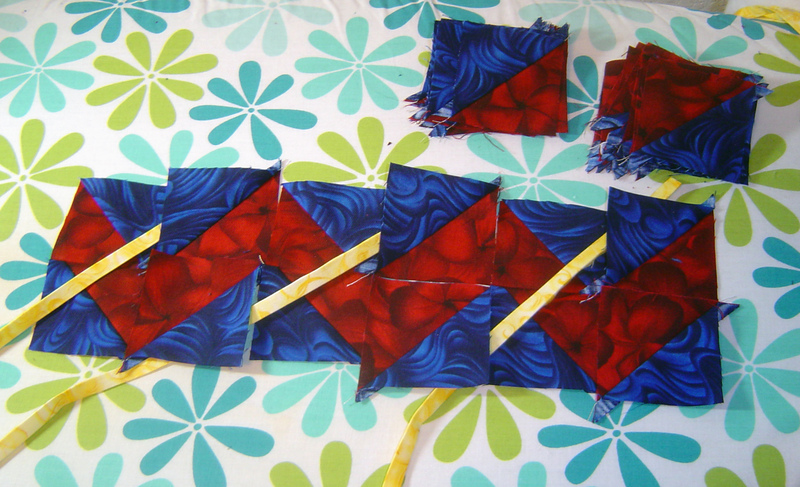 So half square triangles of blue & red, with yellow 1/2 inch strip in between. I have part of it figured out, but I need to do some calculating for the other part. I have no problem with making bias tape for the part that travels over the red. And I have some made. But the problem is going to be with the bias & the blue portions. Here’s part of my blocks right now. but I think things backwards most of the time. Still have to create & recreate scenarios in my head & make the mistakes before settling in. Anyway this is where I am at. Well I have been starting more on the Journey Steps quilt too. Needed to remove myself from the orange. I was reading an article about being ineffective & for sure that’s me. Don’t focus, don’t put things away, don’t stick w/ one project before moving to the next. But that’s me. And that was sewing today. & yesterday was shopping and later this week is wrapping & wrapping up shopping. Good holidays if I don’t make it back in time. Can’t wait to share progress on my hexagon periodic table quilt – coming soon! Today was Saturday, but it really is Tuesday in real life, but my ‘Saturday’ from work. While I love it this time of the week, guess which day of the week I’m not so happy about the whole thing? Anyway, over the past several days my computer, iTunes, browser just was behaving badly. Which in turn, leads either to TV / movies, or sewing, sewing, sewing, (or house cleaning, but none of that today, thank you very much), ore shopping, shopping. In my sewing, I have been pretty much addicted, don’t really wanna stop. 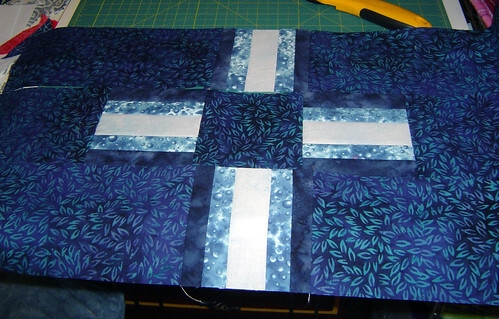 I worked on borders, after thinking about the borders/loss of borders on my exothermic quilt, I had borders on my mind. First I sewed together my card trick and got the inner border on. Looks very spiffy as it is. Now I am going to put borders on the outside that are the same plain background with blocks either only in the corners or in the corners and sides both. This quilt sat for several hours on the floor like this. 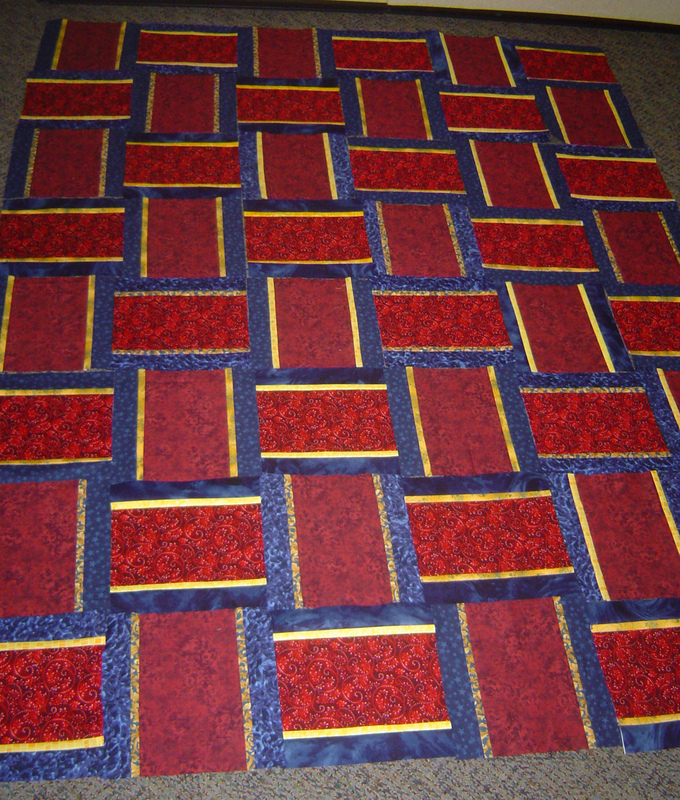 I think just for difference sake (several other quilts have corner blocks), I need to bring in the blocks onto the sides. 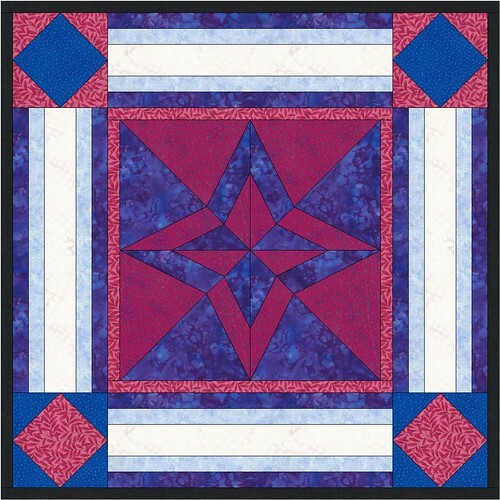 I almost wish I had not cut my borders already for this quilt and could put them on point. But what can you do now after this I have hardly any of the background left? And then, I decided to go ahead with a black & white border plan for my disappearing 4 patch quilt. I don’t think I shared, but it involved a high print fabric as a wider inner border and black & white checkerboard. I purchased the high print border today, I don’t generally buy a lot of high print fabric. This is meant to be 4 inch border around the middle but as the fabric is not washed yet, then I can’t spread out the fabric any more for the audition. So the inner border is NOT yet done on this quilt. And the border corners are just going to be simple blocks of the same high print fabric. There is quite a bit of blue-green in the border, which is not really present in the quilt, but I (so far) think that’s okay due to the scrappy nature of this quilt, hopefully that will tie everything together. Also, serendipitously, I made the black and white border the same size as the patches in my D4P (Disappearing Four Patch) block, they are 4 inch finished. Which makes the math really easy to work out for the inner borders, they have to be 4 inches in size each to fit as well. Not all quilt math has to be hard. I have my ten minute blocks all packed away into rows (with post-it notes & pins) after laying them out on the floor on Sunday morning. I hadn’t really thought about borders for this quilt until shopping this afternoon, and I saw a teally/purple batik that I really liked (not exactly quilt shop quality, but hey, I liked it). 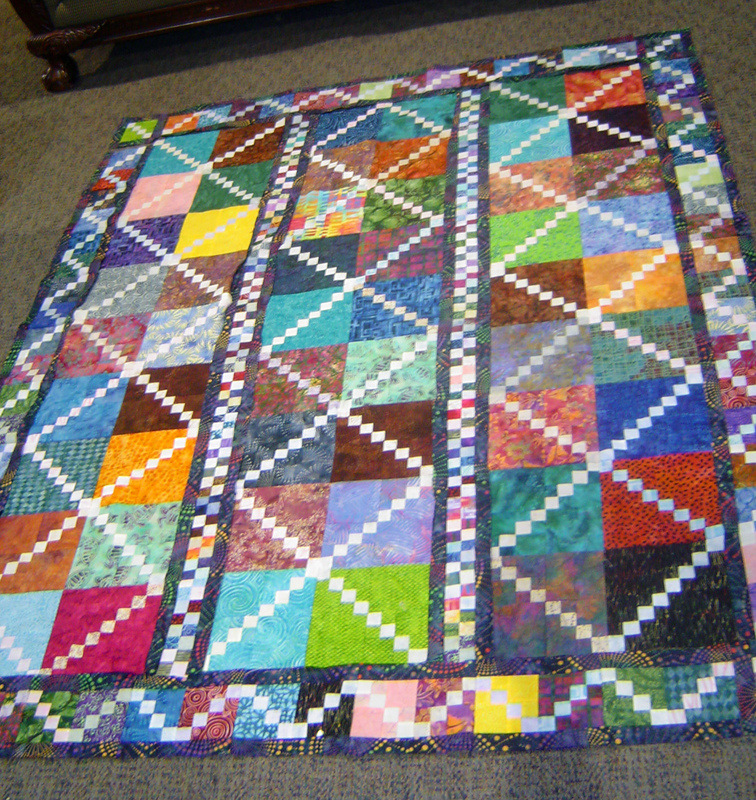 The picture above also shows some of the other work done over the weekend on preparing the cathedral window quilt. I have only pressed 1 row (5 blocks) with the iron, and only “cathedraled” that one row with pins, so not too much preparing. And I decided that only some of the blocks will get the fancy grey center. All my pieces are cut for this quilt, and no I am not going to ‘cathedral / ten-minute block’ in between each of the blocks, even though I can. This quilt already has a lot of work ahead of it, especially for being a ‘last minute bonus type of quilt’. A few posts ago was my 200’th post. And in honor of that, I had a surprise idea (even to myself) of giving away a mini quilt. I said I was going to put borders on it & quilt it, so the weekend of borders, behold, it has borders now. So now it’s roughly 17 X 34 unquilted in size. 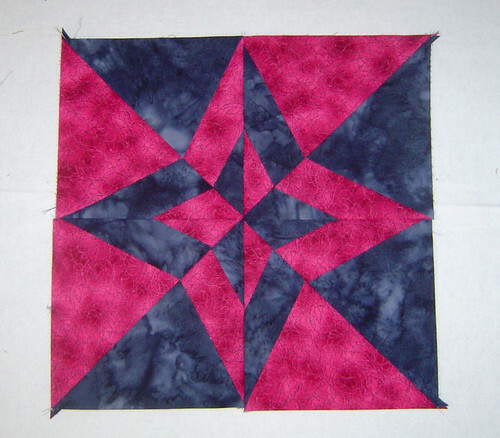 I plan to quilt this with FMQ (not sure what yet to do, but something other than Stitch in the Ditch). It’s a mini quilt that’s not quite so mini. I plan to use a mulitcolor, multi-strip binding bringing in some of the purples & burgundies & greens that are found in the center of the quilt, staying away from the teal I already have in the rest of the borders. 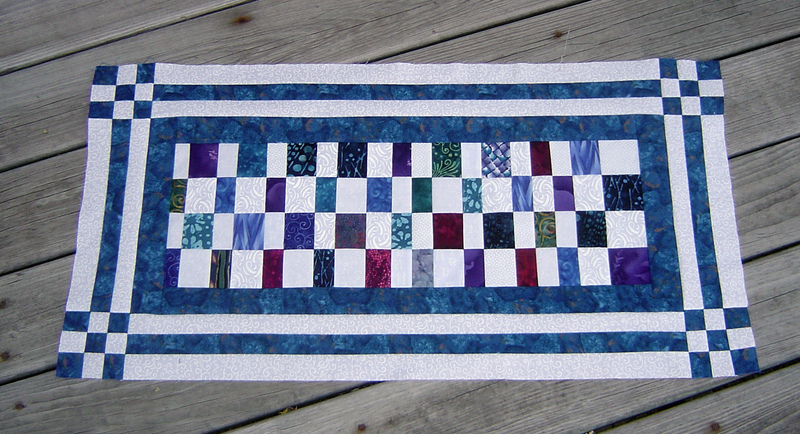 I only had 4 people comment on that post, so if now this quilt appeals more to you, let me know by sending a comment on Strip Sorting Surprise. I would love to be able to give it away to someone once complete. Currently I am not planning on putting a sleeve on the quilt, mostly due to time, but one can always pin a sleeve on the back for a wall hanging. Unless …. someone has a fast & easy sleeve method they would like to share. I don’t really like the hand sewing down the sleeve to the back of the quilt. … Or I could sew little holders into the binding that could become visible holders, that I may do, but that may determine horizontal or vertical which I don’t necessarily want to do (this quilt works both ways I think). Those are my thoughts today on quilt borders. Maybe I should put this and a few more ideas into quilt border podcast episode since I’m currently stuck on my other episode (don’t ask, my bad on that one). I am starting in my adventure on Twitter. If you would like to follow me, I would appreciate it. I am also about finished with my little quilt guild project for the quilt guild show auction. Here is my design on EQ7. 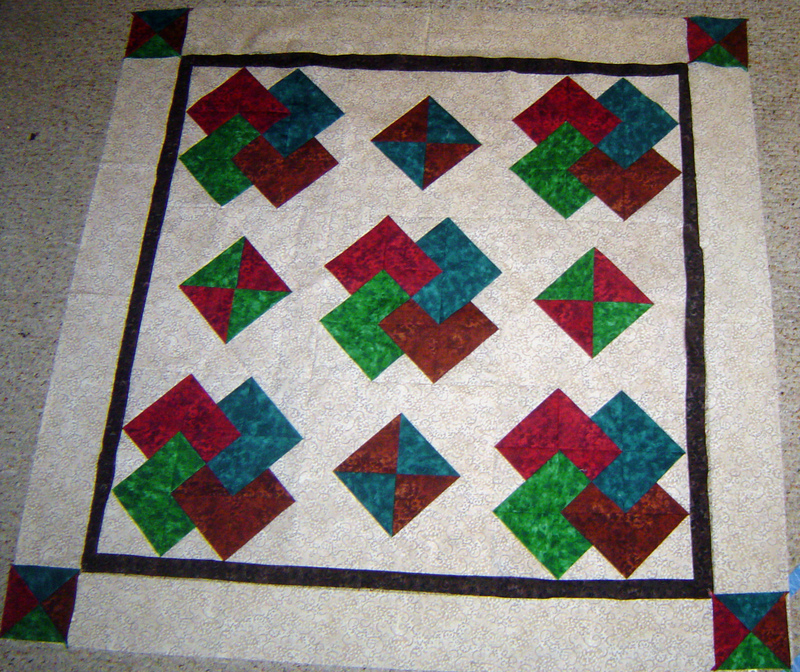 And my completed center block that I paper pieced. And then I put the square in a square blocks together. And then I got ready to put the borders on! And then I still cut them too short! Corrected the borders, and now quilt top is complete. And then I am working on the back, since my piece was too short, I decided to put the left over borders into the designs. I did finish the back with more of the blue batik on the top and bottom of this. Now to raid the kitchen to baste and quilt this piece! I would like to name this quilt something about the morning twilight as that’s when I quilt the most. Something about dawn, or crimson sunrise or something similar. The block is called night and day.